#23- Going to Ohio & England! I’m going to Ohio & England! I will be explaining Sashiko and Circular Flounces. You would think that after writing about these 2 techniques it wouldn’t take long to prepare for the segments. But to squeeze all the information into a 10 minute talk meant making a full sample for each step, as opposed to the book, where I had to make 1 perfect sample and take a photo , then move to the next step on the same perfect sample and take the next photo. Live and Learn! The taping in Cleveland, Ohio will be February 9th. I will be in Cleveland for most of Feb. 8th with little to do, so any suggestions for fun things to see/do are welcome. On February 12th, my husband and I are going to London U.K .for a week! WooHoo! 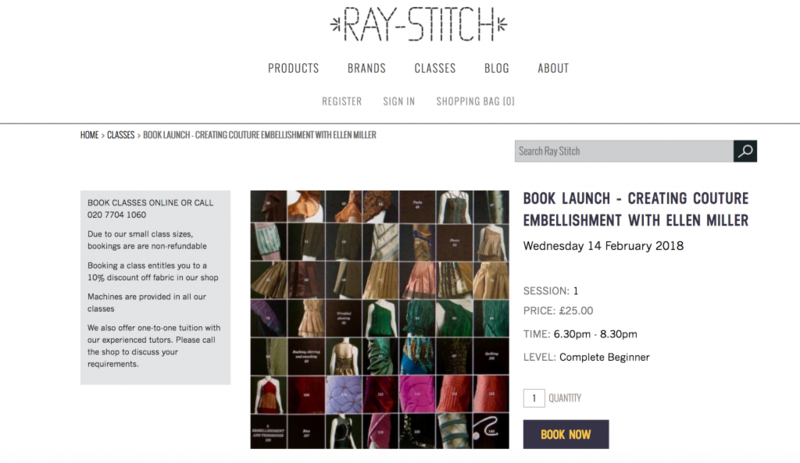 While we are there I will be talking at Ray Stitch on February 14th, 6:30-8:30 pm! This will be my official book launch in the U.K.! I will be explaining some combination of: Sashiko, Circular Flounce, Bias and Embellishing RTW shirts. My husband and I don’t have many plans for our week in the U.K. so suggestions are very welcome. Of course the V&A Museum and the British Museum are on our list , but any other suggestions? Last but least, I have not forgotten that I still haven’t posted photos of the Mother of the Groom dress! I will have some down time in Ohio, so I hope to post those photos next week. While you are in the Cleveland area, Kent State Fashion Museum is a wonderful place to visit : http://www.kent.edu/museum. If you want to stay closer to Cleveland proper, Praxis has a month long display of Janice Lesson-Moss’s superb weavings. Here is her website : http://www.janicelessman-moss.com and here is the Praxis Fiber Workshop website : praxisfiberworkshop.com. Praxis is full of weaving looms donated by Cleveland Institute of Art when they downsized. Ms Lesson-Moss’s weavings are displayed in their gallery at the front of the workshop. Located on the east side of Cleveland. Enjoy your visit to my city!